Wash and dry the three zucchinis. Slice lengthwise into long strips, discarding the outermost pieces of skin. You should be left with 15 slices. Place the strips onto a baking sheet and coat with a bit of olive oil on each side. Season with salt to taste. When ready, remove from heat and let cool over a baking sheet. Once cold, place a half tablespoon of herb cheese on one end of each zucchini slice. Roll the strips of zucchini closed and secure with a toothpick. Serve immediately or keep chilled until ready. These rolls can be prepared the day before to save time. A few weeks ago I had the opportunity to attend the wedding of one of my college friends. 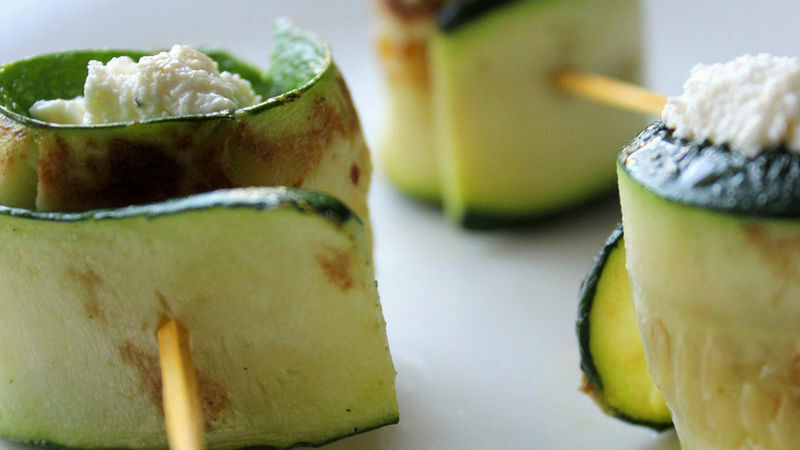 During the reception, this delicioso appetizer was served made from grilled zucchini. The mother of the bride had prepared them and explained to me how fast and easy they are to make-I decided that this was the perfect recipe for sharing with you all. I hope you have the chance to prepare them yourself either for a wedding or your next special occasion.